Forgive me... today's post isn't really about paper, but it is about quilling... quilled aluminum, to be precise. Ever heard of such a thing? I had not, but have to say the idea is intriguing! 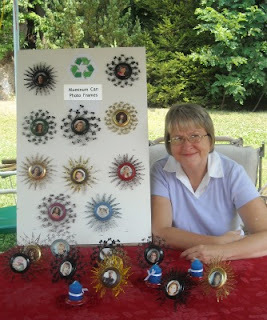 Carol of Etsy shop, Ridgerunner Connections, began twirling aluminum back in the 1970s, the same decade paper quilling had one of its resurgences. 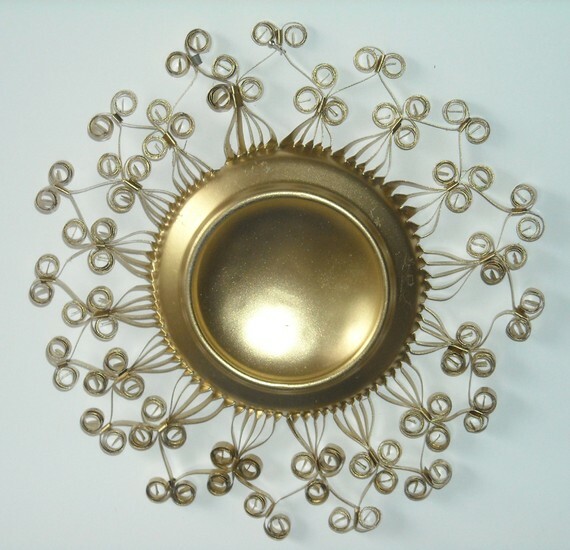 Can you guess the type of aluminum she used to quill this flower? A Coke can... but of course! Carol first learned the technique via a doll chair kit, and says the style reminded her of the peacock chair Morticia Addams of The Addams Family would sit in. The kit came with three tools of different sizes; each had a flattened end with a slit in it. 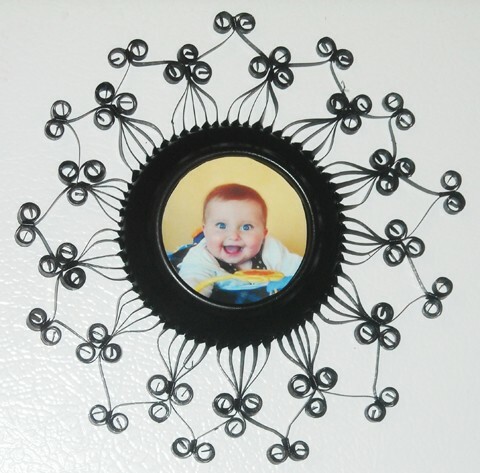 After making lots of chairs, Carol branched out and created her first round photo frame. Fast forward several decades - she's returned to the frames, and has also designed a sunflower, which can double as a candle holder, or if not quilled entirely around the circle, a standing photo frame. 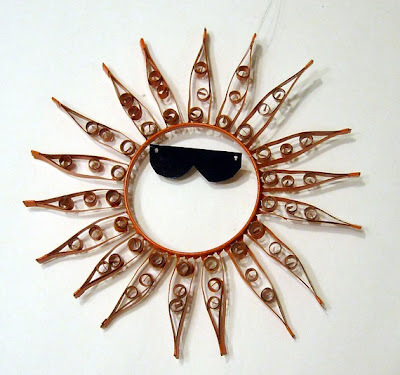 Suncatchers and snowflake ornaments are also popular. Carol uses a utility knife to carefully cut the top or bottom of the can.... she says to be wary, as splinters are possible at this point. To cut the strips, Carol uses a regular pair of scissors, but has never been injured during that part of the process. "The scissors make such a nice edge; it really isn't sharp. Then I cut the number of strips I need for whatever design I'm making. Learning to cut straight strips in the rounded can is the only real trick." Carol isn't sure she would have the patience to try paper quilling, saying the advantage to working with aluminum is that the quills stay put once they are curled. I'd love to see her try though - I bet she might enjoy it! so beautiful! What a nice idea using Aluminium cans. Its also washable! Excellent and beautiful use of recycled material. 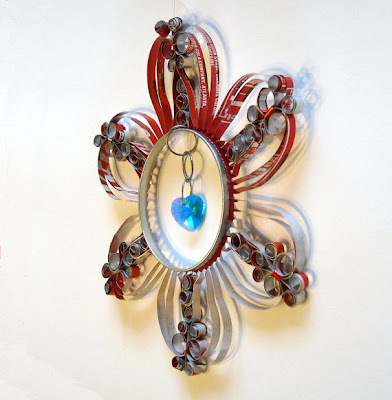 Fantastic work - I have seen pop cans used for many things but never for quilling. What a great idea. Great work, and a wonderful use for empty cans! It would be a great way to use all those empty diet coke cans I generate... though I'm not sure I trust myself to cut strips of them without slicing a finger! Carol makes the process sound easy, but her work tells us otherwise. Beautiful! Very cool.. I have a set of furniture made from aluminum.. have never been brave enough to try and cut a can like that.. absolutely beautiful work... thanks..
Just loved the pic frames..and i too made ..it looked easy..but it was not..but i had fun making...thanks a lot for the inspiration..